I hope everyone had a lovely Thanksgiving with lots of good food and family time. We are extra thankful for a few days in Ohio and the ability to spend time with both sides of the family. It was great to unplug for a few days, but now that we are back home the craziness has started. I mentioned in a previous post that we recently bought a house, we are excited, but have a lot to do in the next month. The last several Decembers have been crazy between having babies in December, working full time and being sick and pregnant. This year I was hoping for a calmer December to have more time to reflect on the meaning of Christmas and enjoy the decorating and gift giving a bit more. I will hold out hope that next December will be calm, because we are planning to move into our new house before Christmas and it needs a bit of work before we move in. Making Christmas cookies is one of my favorite December activities, but with the way the next few weeks were looking, I decided, I better take advantage of a calm week in November to make cookies and treats. I have most of what I need for the season in the freezer and hopefully over the next few weeks can share some of my favorites with you. 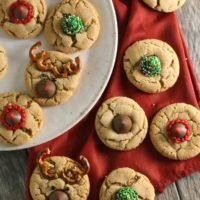 I’ve been dying to share these Christmas Peanut Butter Blossoms with you, but thought I should wait until after Thanksgiving before jumping the gun. I have strong feelings that the simplicity and meaning of Thanksgiving shouldn’t be overwhelmed with early Christmas bustle. But now that Thanksgiving is over, I’m blaring the Christmas music. 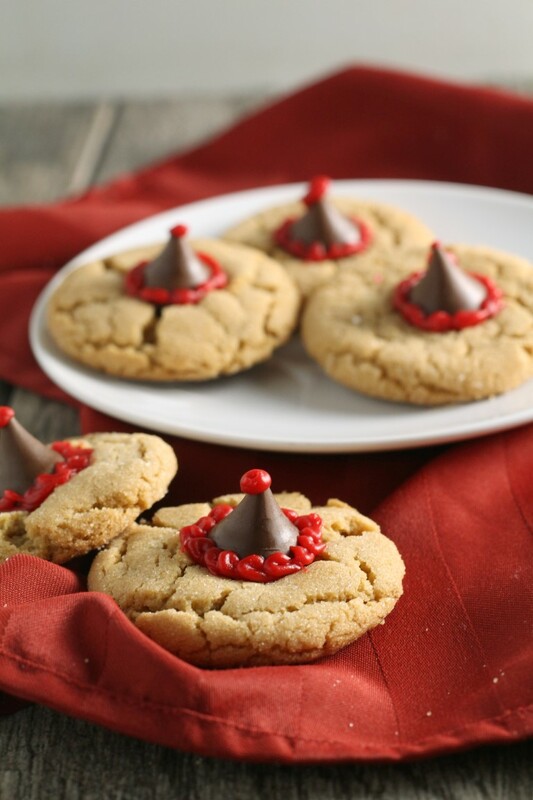 It’s super easy to upgrade traditional peanut blossoms into this Christmas version. I just bought red and green frosting in a tube. Then all I needed was sprinkles, pretzels and black gel for the reindeer eyes. Let me know in the comments below if you have any other creative variations for these Christmas Peanut Blossoms. to have more time to reflect on the meaning of Christmas and enjoy the decorating and gift giving a bit more. Preheat oven to 375 F. In a large bowl, cream together the butter and brown sugar. Beat in the peanut butter, egg and vanilla. Stir in the flour, salt and baking soda. Roll into 36, approximately 1-inch balls. Roll each ball in granulated sugar. Bake at 375 F for 8-10 minutes or until lightly browned around the edges. Remove from the oven and immediately press an unwrapped Hershey Kiss into the center of each cookie. 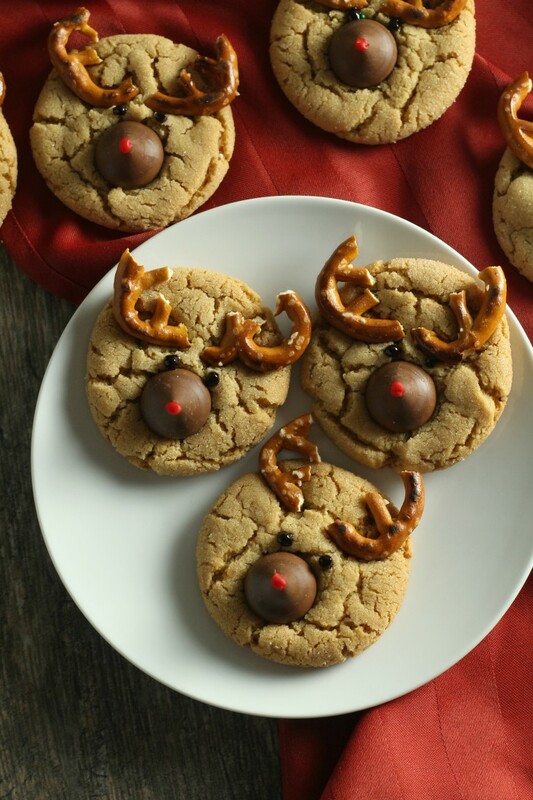 If making reindeer cookies, press the broken pretzel pieces into the cookies for antlers as well. Let cool on cookie sheet for 2 minutes before removing to a wire rack to cool completely. 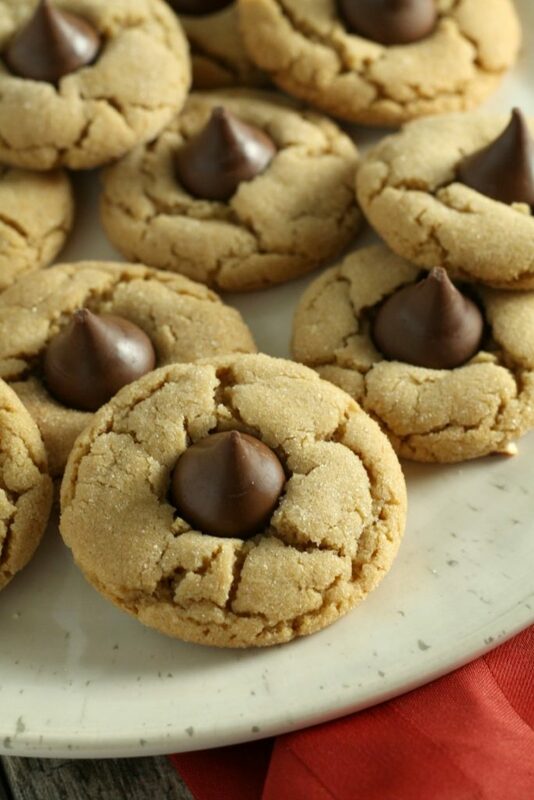 Let cookies cool completely and until Hershey kisses are no longer melted. Then decorate. To make the reindeer cookies, add two little eyes with the black writing gel. And pipe a dot of red frosting on the top of the Hershey kiss for a nose. To make the Christmas trees, pipe green frosting in a spiral around the Hershey kiss. Then, add add the sprinkles for ornaments. To make the Santa Hats, pipe red frosting around the base of the kiss and on top. 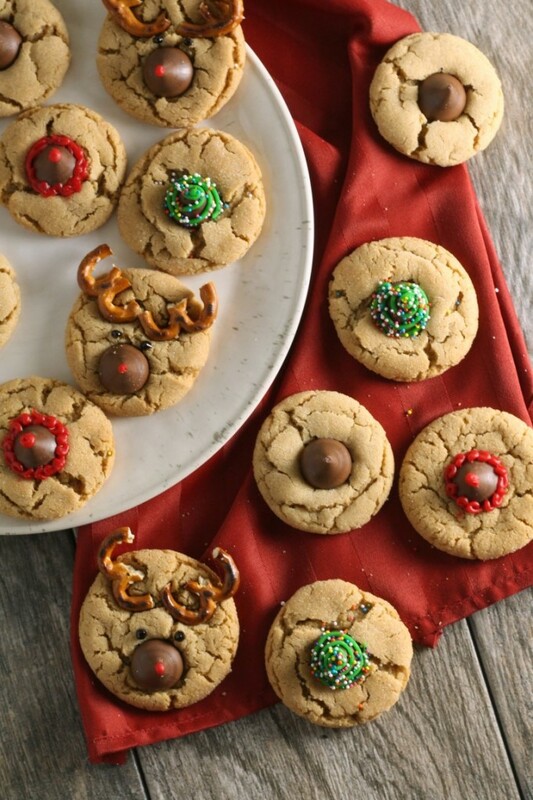 These Candy Cane Kiss Cookies from Recipe Girl look super cute for Christmas too. 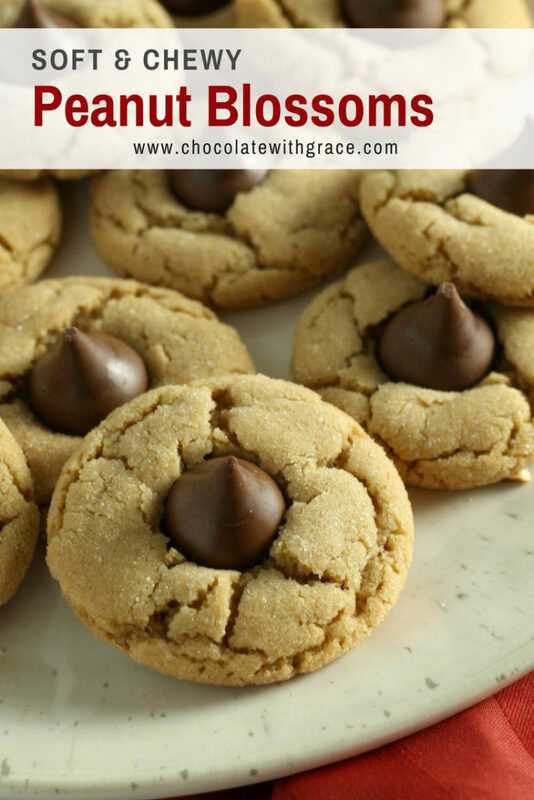 Or these Hershey Kiss S’mores cookies or these Chocolate Kiss Cookies. 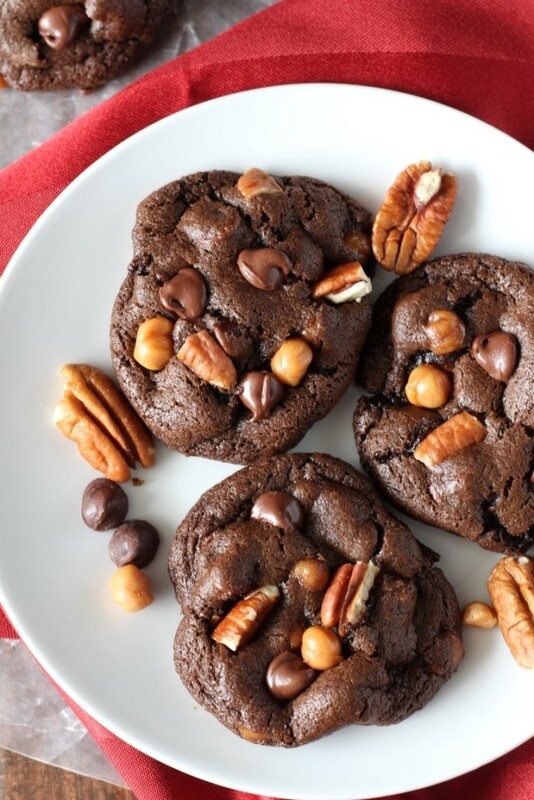 Next, try my chocolate turtle cookies! Hi Gerry, Go the to recipe card, and underneath the picture in the recipe, there is a print button. Happy Baking! These are so cute! 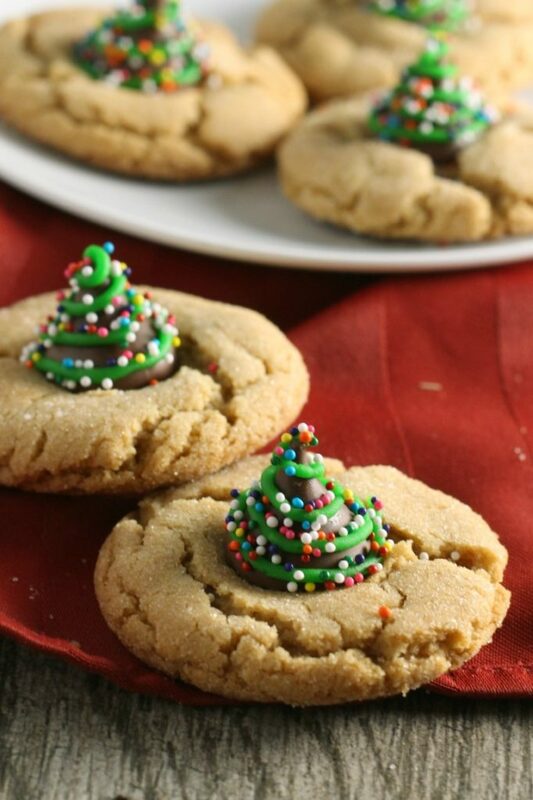 What a smart spin on a classic cookie to make it into a festive Christmas cookie!